Annoyed with your jigsaw’s cord getting in your way while you cut? Then you are probably looking to replace it with a cordless jigsaw! You are in the right place: we will provide you with all the info you need to get the best cordless jigsaw, as well as will suggest a couple of great options to you! 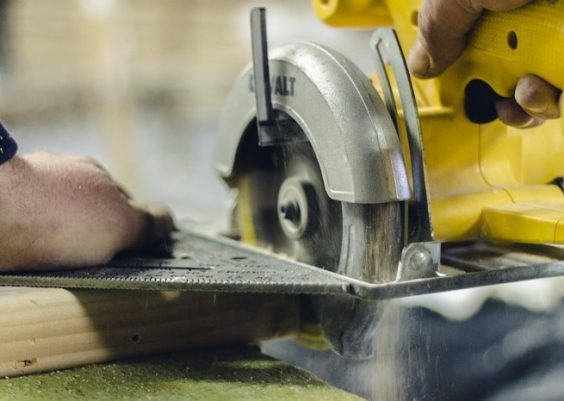 Why choose a cordless jigsaw? 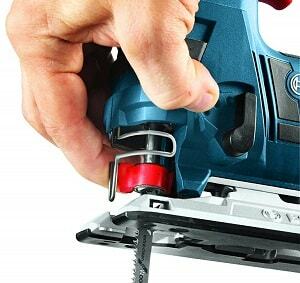 Makita XVJ02Z Jigsaw – Best in its class! You would want to use a cordless jigsaw for the same reasons as a corded jigsaw. Namely, jigsaws allow you to do cuts – like plunge cuts – impossible for other types of saws. In addition, jigsaws allow you to make cuts of any shape and length in a wide variety of materials. Cordless jigsaws can do all this as well. However, their cordless operation allows several additional benefits. The main benefit of not having cords is that you aren’t restricted to a power outlet. You can make cuts anywhere as long as there is battery charge left in the jigsaw. A less important but still significant benefit of cordless jigsaws is that there are no cords to get in your way. There is no risk of the power cord tangling or restricting your movements. Of course, you’d need to make sure that you have battery charge, but some people prefer keeping an eye on a battery to battling with cords or being unable to do cuts anywhere they need. If you are looking for top performance in a cordless jigsaw, then something like Makita XVJ02Z may be the right choice for you. This is the priciest cordless jigsaw on the list, so you could expect some great things from it. The motor of this cordless jigsaw operates at 800-3500 SPM and has 6 speeds. This wide range of speeds should allow this jigsaw to handle any task and material you throw at it. What you may also like is that the speed selector is located on the side of the jigsaw, so you won’t be changing the speed accidentally. The brushless build of the motor is also remarkable. Brushless motors tend to be more durable and energy-efficient than brushed motors. As Makita claims, the brushless motor of this unit is optimized to deliver 50% longer runtime than regular motors. 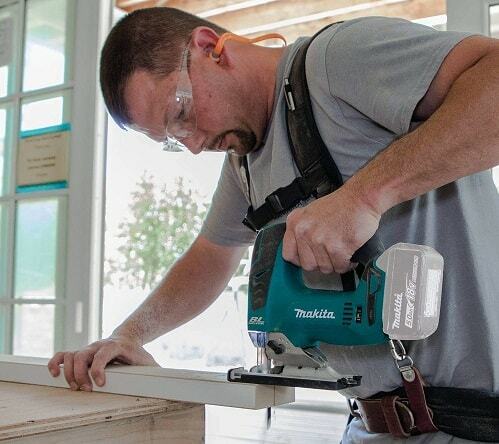 Makita XVJ02Z has a heavy-gauge aluminum base for accurate cutting. The XVJ02Z moves the blade in an orbital trajectory to make cuts quicker and more aggressively. Its 3 orbit settings allow you to adjust the speed with which the jigsaw will cut into the material. This cordless jigsaw also has a 1-inch stroke length, so thicker workpieces won’t be a problem for it. 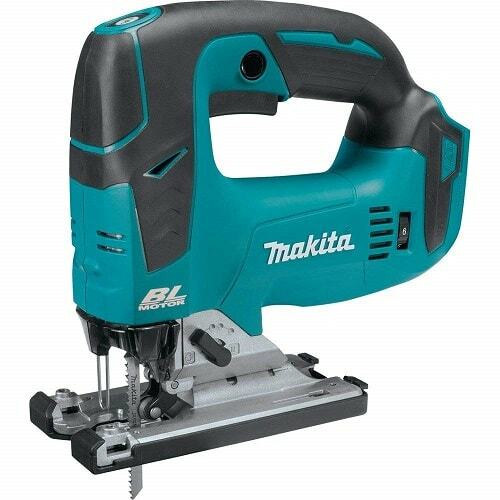 The Makita TXVJ02Z jigsaw is good in terms of convenience as well. It keeps the working area dust-free with its dust blower, first of all. Besides, it has a dual LED light that can come in handy in low-light conditions or when cutting darker workpieces. And yeah, it also has a shoe that can be set to any angle within 45 degrees. Makita also put their soft start feature in this jigsaw to suppress the start-up reaction and make the tool more controllable at startup. At least, that’s what they say. In reality, this feature can be more annoying than helpful. For example, if you are continuing a cut in a workpiece, the jigsaw may jump around at first due to the soft start. The soft start feature thereby may require some getting used to. Another downside is that Makita doesn’t include batteries or chargers with this jigsaw. The jigsaw is pretty pricey as-is, and you’ll need to spend even more money on battery to get it working. The Makita XVJ02Z only supports T-shank blades. The motor is good for any material. Illuminates the cutting area and keeps it dust-free. Doesn’t come with either battery or charger buy you can buy in bundle. The slow start feature may be more annoying than helpful. If you are willing to pay the high price for quality and performance, Makita XVJ02Z may be the best cordless jigsaw for you out there. But don’t forget about the annoyance of its soft start feature. DEWALT DCS331B jigsaw is a pretty inexpensive cordless jigsaw, but it had a couple of things to surprise us with. First of all, it has got a variable-speed 0-3000 SPM motor, which should be sufficient for any material you can cut with a jigsaw. In addition, this jigsaw has 4 orbit settings, allowing you to approach the cutting more precisely. What this cordless jigsaw also has to boast is its 1-inch stroke length. With it, no workpiece should be a problem for you. 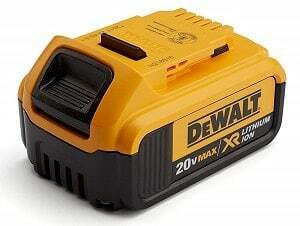 DEWALT DCS331B’s battery is cheaper than Makita’s. When it comes to convenience, there are a couple of things that make DEWALT DCS331B jigsaw stand out. The first is its bevel that can be angled at 0, 15, 30, and 45 degrees without the use of any tools. With most jigsaws, you need to use some kind of a tool to adjust the bevel angle. The adjustable dust blower is also noteworthy. Unlike most jigsaws where the blowers work at constant power all the time, the blower in this one can be adjusted. Unfortunately, even great products have downsides, and DEWALT DCS331B jigsaw is no exception. It has 2 downsides that should be noted. The first one is that it comes with no batteries or chargers, so you will have to get them separately. In addition, this tool only supports T-shank blades. And the second downside is that the shoe’s plastic baseplate likes to come off, so you may need to deal with it. The dust blower can be adjusted. The plastic baseplate likes to come off. 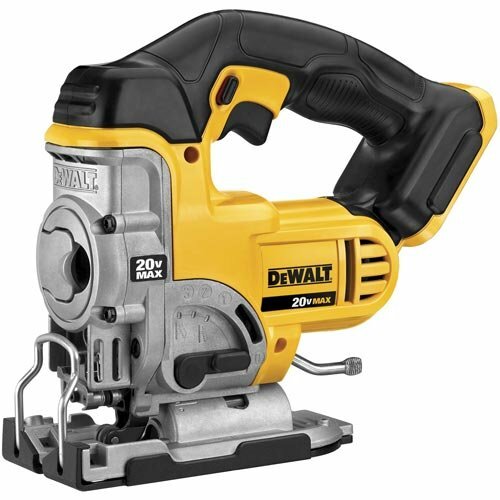 For a pretty attractive price, DEWALT DCS331B cordless jigsaw has a lot to offer. In terms of price-value, DEWALT DCS331B is thereby an excellent jigsaw. Hitachi CJ18DGLP4 is quite a bit cheaper than Makita XVJ02Z, but it may be a more interesting jigsaw for you. This cordless jigsaw has a motor operating at speeds up to 2400 SPM, which makes it more suitable for harder materials that require lower cutting speeds. The motor speed is adjusted by the pressure on the trigger. And once you find the right speed, you can lock it via the trigger lock button on the side of the jigsaw. Like Makita XVJ02Z, the Hitachi jigsaw has 3 orbital settings to allow you to control how aggressively it cuts into the material. And the length of its stroke is also the same – 1 inch. Hitachi CJ18DGLP4 doesn’t have an inbuilt dust blower in it, so you will have to stop occasionally to blow away dust. However, this jigsaw has a LED light and a 45-degree-adjustable shoe. Another convenient feature that this jigsaw has is an onboard storage pocket for up to 6 blades. This handy feature allows you to keep all your blades nearby and within easy reach. And the last remarkable thing about this jigsaw is that it is covered by Hitachi’s lithium-ion tool lifetime warranty. Moreover, this cordless jigsaw accepts both U-shank and T-shank blades. Illuminates the cutting area with a LED light. You can keep up to 6 blades in it. Doesn’t have a dust blower. 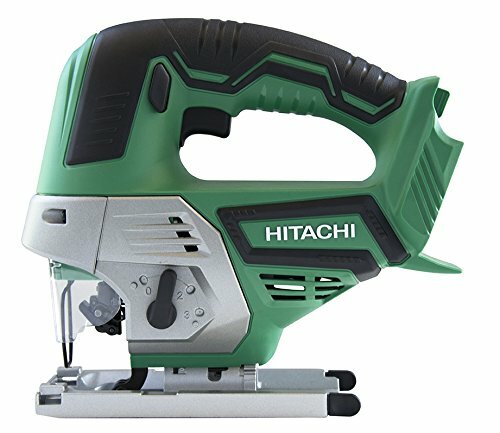 If you are looking for a not so expensive cordless jigsaw to cut harder materials with, then Hitachi CJ18DGLP4 could be the best option for you. But keep in mind that you’ll need to blow dust away manually! BLACK+DECKER BDCJS20C jigsaw is a very inexpensive jigsaw. Having only a few basic features, it is a good option for people who will be mostly doing simple projects. The motor of this jigsaw is similar to that of Hitachi CJ18DGLP4. Operating at up to 2500 SPM, it can deal with hard or delicate materials that require slower cutting speed. In this sense, this jigsaw and Hitachi CJ18DGLP4 are close to each other. This is where their similarities in cutting performance end, however. This cordless jigsaw doesn’t have orbital cutting capability, so it will most likely have a harder time cutting through materials. The stroke length of BDCJS20C is just 3/4 inches long as well, so you won’t be able to cut thick workpieces with it. In terms of convenience, BLACK+DECKER BDCJS20C may be better for you than Hitachi CJ18DGLP4. That’s because this little guy has an inbuilt dust blower, so you won’t need to stop it every few seconds to blow the dust off of the workpiece. BDCJS20C also allows you to angle the shoe up to 45 degrees for angled cuts. In addition, this tool supports both U-shank and T-shank blades. Among the cordless jigsaws reviewed, BDCJS20C is the only one that comes with a battery and charger. You won’t need to spend additional money to get them, which makes BDCJS20C a great pick for buyers with a very limited budget. The dust blower keeps the cutting area clean. Comes with a 20V battery and charger. 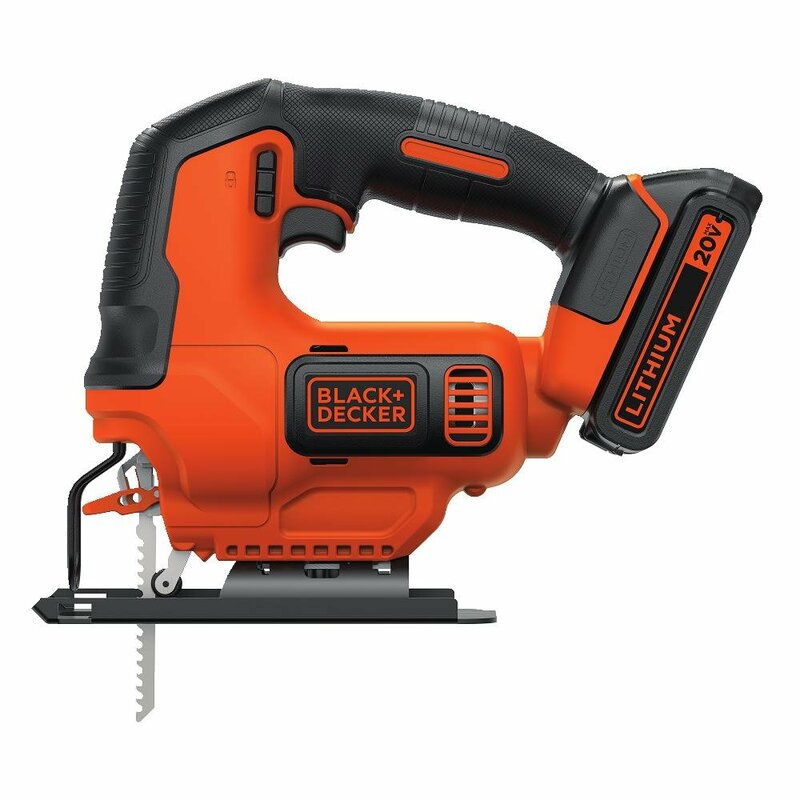 Very inexpensive, BLACK+DECKER BDCJS20C is a good pick for people with a tight budget. Lighter projects should be no problem for this jigsaw as well. The first thing to catch the eye in Milwaukee M12 cordless jigsaw is its design. It differs completely from what you would typically see in jigsaws. The handle of M12 jigsaw is positioned lower and closer to the shoe. Thus, the center of gravity in this jigsaw is positioned lower. This should make M12 jigsaw much more convenient to use. The convenience of this cordless jigsaw is further improved by the tool-free bevel adjustment & blade changing, as well as the inbuilt LED light. The one thing we wish M12 had though is a dust blower. With its speed-variable 2800 SPM motor and 3/4-inch stroke, M12 cordless jigsaw is suitable for a wide variety of thinner workpieces. Either hard or delicate materials shouldn’t be an issue for this jigsaw, as long as they aren’t too thick for the 3/4-inch stroke. What this cordless jigsaw also lacks is orbital action adjustment. Due to this, it may be more difficult for you to cut into materials with this jigsaw. And yeah, Milwaukee also doesn’t include batteries or chargers with this jigsaw. The Milwaukee M12 only accepts T-shank blades. Convenient grip with a low center of gravity. 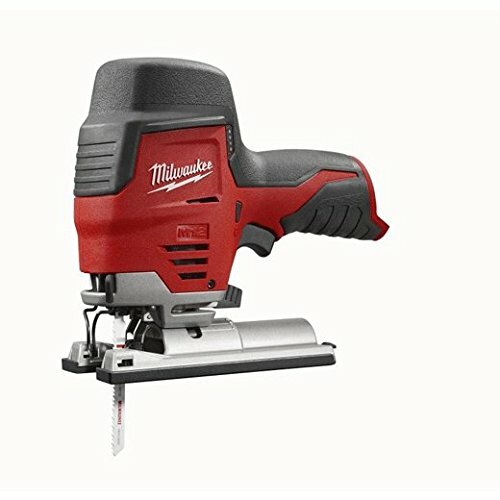 If comfort of use is a priority for you, then Milwaukee M12 jigsaw could be the best cordless jigsaw out there for you. Besides, it may be a great choice for cutting any material as long as it isn’t too thick. 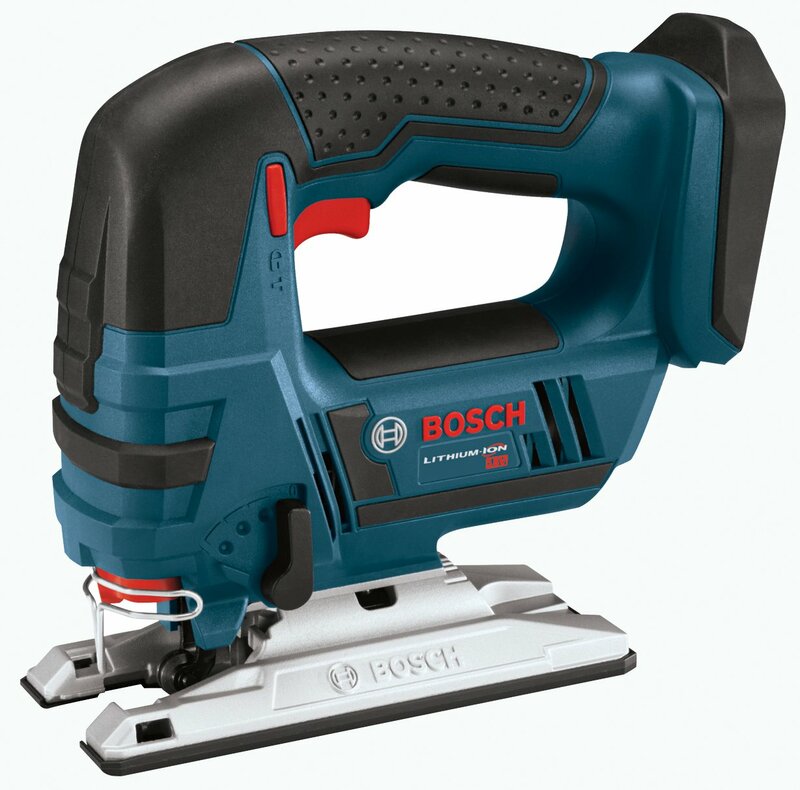 Being not a very expensive cordless jigsaw, Bosch JSH180B has a lot to offer. In terms of cutting capacity, we can’t say that JSH180B is something very special. It has got a 1-inch stroke, 0-2700 SPM motor, and 4 orbit settings. This is all great, but we’ve already reviewed DEWALT DCS331B that had about the same cutting capacity. However, its comfort and easiness of use where JSH180B excels. The main feature that makes this thing stand out is its tool-less blade ejector. It allows you to switch out the blade without touching it, which can come in handy if you are dealing with hot blades. Aside from the blade ejector, the JSH180B also has an onboard dust blower and a LED light to illuminate the working area. And yeah, you can also do up to 45-degree bevel cuts with this thing. The only other thing we wish this jigsaw also had is keyless bevel angle adjustment. The only downside that we found in JSH180B is that it doesn’t come with batteries or chargers. But that’s a thing that you’d have to deal with in most of the jigsaws we reviewed. The Bosch JSH180B only supports T-shank blades. Can eject hot blades without you touching them. Keeps the working area illuminated and dust-free. Bosch JSH180B is an easy-to-use powerhouse. 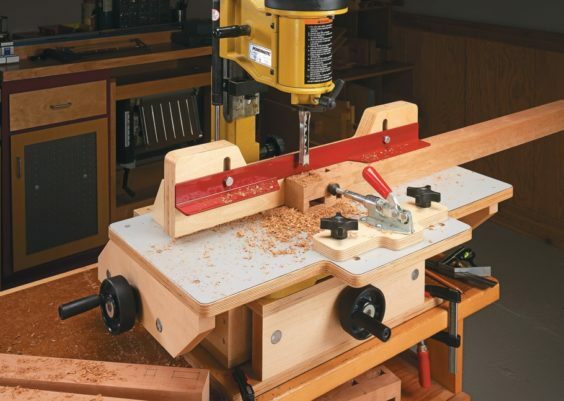 It should be capable of dealing with any projects, aside from probably some types of wood that require very high SPM. And besides, JSH180B offers great value for the money. In terms of pricing, Ryobi One+ P5231 is close to the inexpensive BLACK+DECKER BDCJS20C jigsaw we reviewed earlier. However, there are certain features that could make One+ P5231 a better option for you. The first is the maximum speed of 3000 SPM. If you remember, BDCJS20C had 2500 SPM. Thanks to the speed increase, One+ P5231 can be a more suitable choice for certain woods and other materials that need very quick cutting. Another advantage of One+ P5231 is that it has 4 orbit modes, while BLACK+DECKER jigsaw did not have any. Thereby, One+ P5231 is a bit more versatile tool. The stroke length of this jigsaw is also longer – 1 inch against the 3/4 inches of BLACK+DECKER jigsaw’s stroke. This can be an advantage for users who are going to cut through thicker materials. One+ P5231 is great in terms of convenience as well. It has an adjustable bevel shoe, a dust blower, and a LED light. 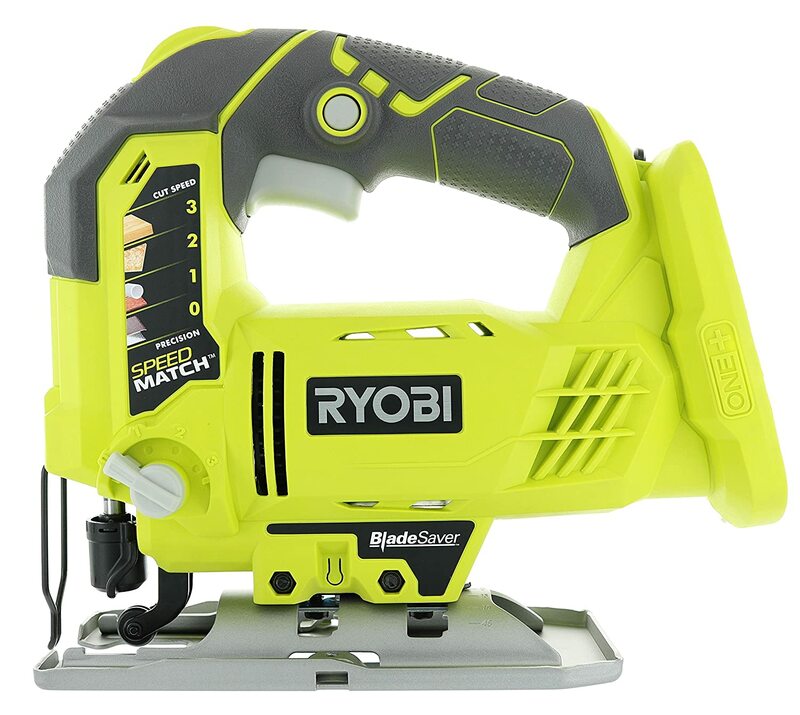 Ryobi includes a woodcutting blade with their jigsaw, so you could get started with woodcutting immediately after getting the jigsaw. One+ P5231 doesn’t come with batteries or charger though – which BLACK+DECKER BDCJS20C did – so you will need to get them on your own. The Ryobi One+ P5231 only supports T-shank blades. LED light & dust blower. You need to buy a battery and a charger separately. Being a very cheap jigsaw, Ryobi One+ P5231 has a lot to offer. It may well be the best cordless jigsaw out there for the money! But keep in mind that it probably won’t be durable enough for high-volume commercial-grade projects. Now that we are done with those 7 great battery-powered jigsaws, let’s have a look at the features that you may want to have in a cordless jigsaw. Let’s start with the blade types. Cordless jigsaw can either support T-shank or U-shank, or both. With T-shank blades, there’s no need to use a tool to change the blade while the U-shank need one. For convenient and continuous cutting, it is more appropriate to choose a jigsaw that supports T-shank blade. More often than not, manufacturers don’t include any blades with their cordless jigsaws. However, if you want to get started immediately, you will want to get a jigsaw that comes with blades. High carbon steel (HCS) blades are good for soft materials like softwood or soft plastics. High-speed steel (HSS) blades are suitable for harder materials like metal, copper, aluminum, and other non-ferrous metals. Bi-metal (BIM) blades are designed for cutting extra-hard materials like stainless steel. 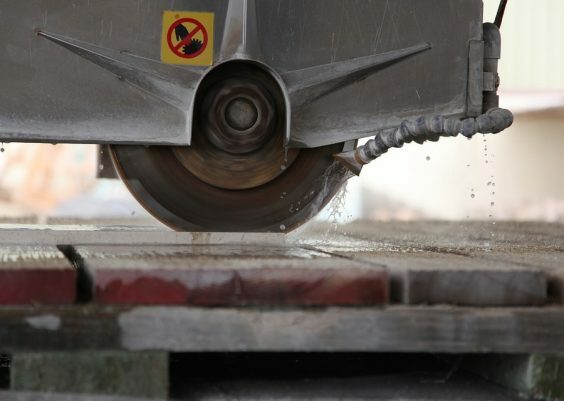 Carbide blades can cut hard materials like stainless steel and cement-bonded fiberboards, as well as make clean cuts through fragile workpieces like tiles. Some of the cordless jigsaw batteries are made with Li-Ion, Ni-Cad or NiMh. If you want a battery that charge fastly, go for a cordless jigsaw with Li-Ion battery. Note: Some of the batteries are sold separately from a bare tool. So don’t forget to check out if the jigsaw you want to buy has a battery available whether in bundle or separately sold. Stroke length is the distance that the blade covers in one stroke. Jigsaws with longer strokes cut quicker and rougher. Besides, the jigsaw’s ability to cut through thicker materials will depend on its stroke length. If you’ll be working with thin and delicate materials, get a jigsaw with a shorter stroke length, and vice versa. And overall, make sure that the stroke length is sufficient for the workpieces you will be cutting. Nowadays, any cordless jigsaw is going to have variable speed. However, the speed range of your jigsaw is going to determine what kind of materials you will be able to cut. 500-1000 SPM, which is good for fragile and delicate materials. 1500-2000 SPM, which is good for harder materials like non-ferrous metals or plastic. Over 2000 SPM, which is good for cutting wood. When choosing a cordless jigsaw, have a look at its speed range and make sure that you are getting the speeds that you need for your workpieces. Modern jigsaws usually have orbital action, i.e. their blades have an elliptical movement. What orbital action allows is quicker and more aggressive cutting into materials. However, it also makes the cutting less smooth. To allow you to do both smooth and quick cuts, jigsaws can have several orbit settings. If you will be working with a wide variety of materials, then your battery-powered jigsaw should definitely have a couple of orbit settings. A dust blower is a really handy feature in cordless jigsaws. They blow the dust off of the working area while you are cutting, so you don’t have to pause your job to remove the dust manually. While a dust blower won’t make your cordless jigsaw more powerful, it can definitely make cutting more convenient. An inbuilt LED light can illuminate your working area, which can really come in handy in low-light conditions or if you are cutting dark-colored materials. If your battery-powered jigsaw has an onboard LED light, you won’t need to set up a lamp or whatnot to illuminate your working area. The last thing to look for in a jigsaw is shoe angling. You probably won’t be able to find a cordless jigsaw that doesn’t have an angling shoe. However, the angling may differ from jigsaw to jigsaw. Some models allow angling at 15-degree increments – 0, 15, 30, and 45 degrees. Others allow you to set the shoe to any angle typically from 0 to 45 degrees. If you really need the latter, make sure that your cordless jigsaw has such a shoe. 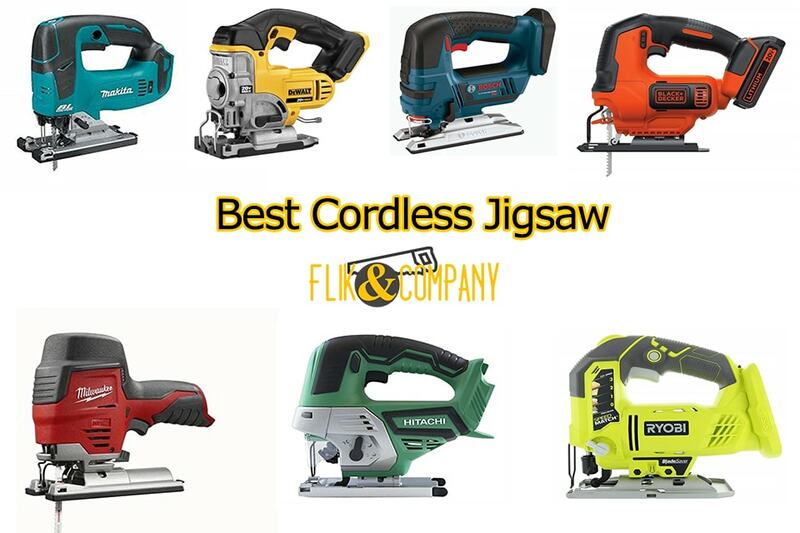 By now, you should know everything you need in order to choose the best cordless jigsaw among the plethora of models on the market. If you aren’t sure which one to choose yet, let us give you a couple of recommendations. If you are looking for top performance and quality, no jigsaw on the list is better than Makita XVJ02Z. It’s a go-to if you are ready to spend the money. Our second recommendation is DEWALT DCS331B. 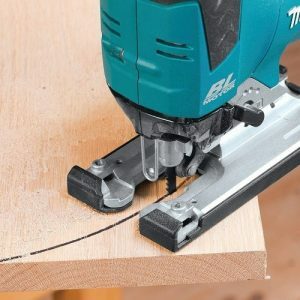 It has lower speed and may not be as high-quality as the Makita jigsaw, but it has plenty of features to offer for the money. DCS331B is similar to Bosch’s jigsaw, but we chose the DEWALT jigsaw over the Bosch model due to the longer 3-year warranty. 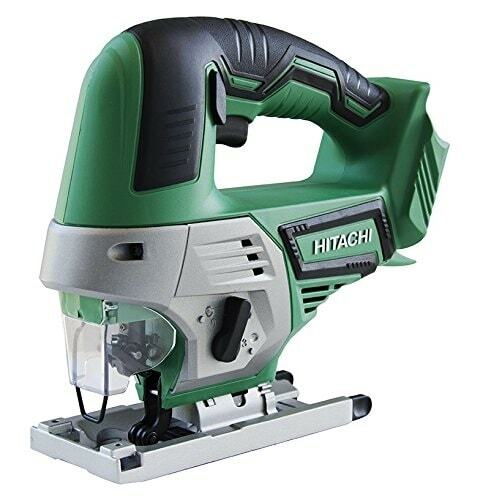 And the last cordless jigsaw we’d recommend is Hitachi CJ18DGLP4. It’s convenient, powerful, and has got a lifetime warranty! But if you liked any other cordless jigsaw in the end, feel free to ignore our recommendations and buy it!